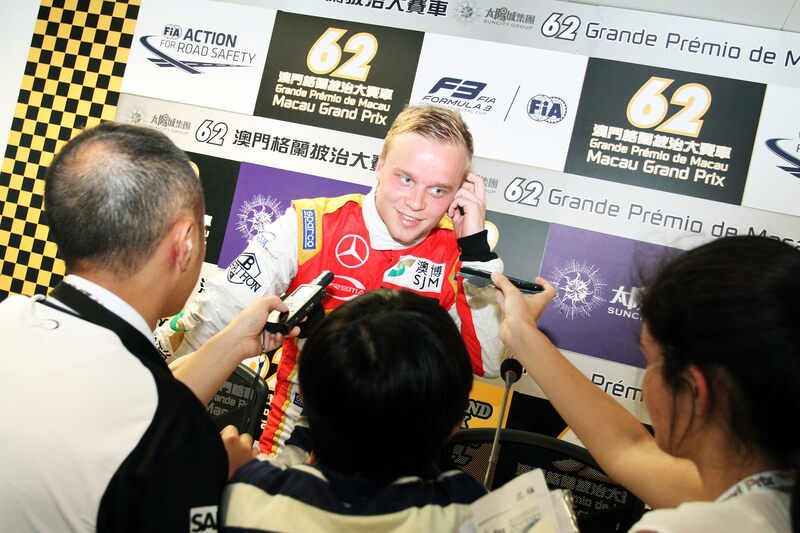 Two-time Macau Grand Prix winner Felix Rosenqvist will launch a fresh attack on the prestigious Far East street race in next month’s 2016 edition, returning to the event’s headline Formula 3 category in pursuit of an unprecedented third straight victory. After first finishing on the podium in the 2012 running of the city-centre classic, Rosenqvist went on to claim consecutive victories in 2014 and 2015, becoming one of only two drivers in the history of the event (alongside Italy’s Edoardo Mortara) to triumph twice in the world’s most prominent F3 encounter. For this year, the Macau Grand Prix has received yet further recognition, with the FIA lifting it to official FIA F3 World Cup status. Rosenqvist’s return to the Chinese race will see him re-join forces with SJM Theodore Racing by Prema, the same squad that carried him to last year’s victory and to the 2015 FIA F3 European Championship title. His team-mates will be Maximilian Günther (GER) and Nick Cassidy (NZL). Rosenqvist has spent the 2016 season combining race-winning campaigns in the Blancpain GT Series Sprint Cup and US-based single-seater series Indy Lights, while also contesting the final four rounds of Germany’s popular DTM touring car championship with Mercedes-AMG DTM. The Swedish 24-year-old will contest the Macau Grand Prix for the seventh time of his career when the international motorsport fraternity descends on the former Portuguese colony on November 17-20. Felix Rosenqvist is currently on site in Hong Kong, just a short boat trip from Macau, for this weekend’s opening round of the all-electric 2016-17 FIA Formula E Championship. The Hong Kong ePrix takes place on Sunday.